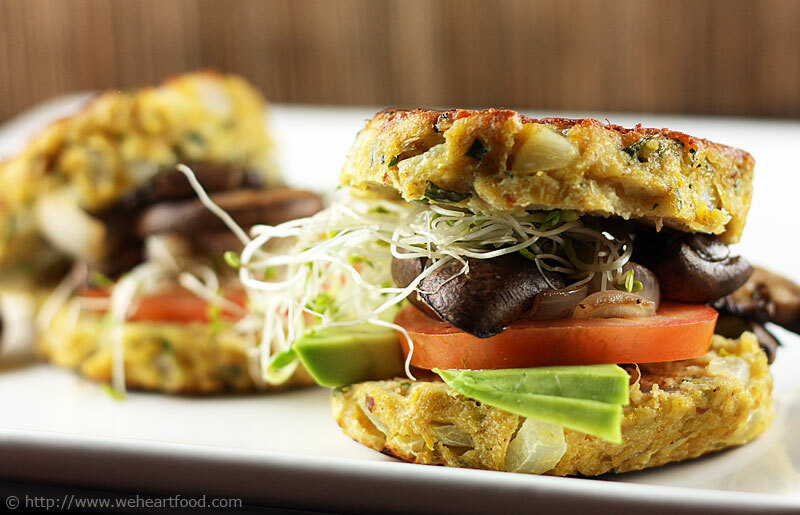 Lisa’s been obsessed with making mushroom burgers since she heard her friend Cathy raving about the one she had in a Roseville restaurant. After scouring the net for recipes, she got ideas for the basic ingredient list and came up with this particular combination, featuring mixed wild mushrooms, breadcrumbs, oats, and spices. We dressed the burger with grilled onions, arugula, and chipotle mayo, and served it with baked acorn squash from our CSA box. Whoa, these are awesome. Good job! They don’t need to be cooked more? I don’t think so — the texture is perfect. Chewy in the middle, and a nice crisp crust. Well I’m glad you like them, we have four more left over! They are pretty delicious… good job on the chipotle mayo. parsley, oregano, salt and pepper. Mix well. Shape into patties. Heat 1 TB oil in large saucepan. 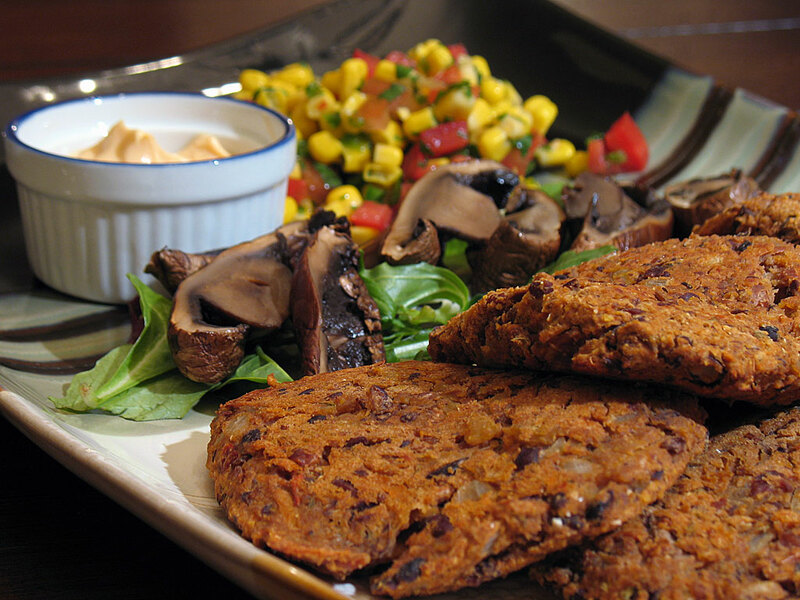 Fry patties, cooking about 4 minutes on each side – or until golden brown. 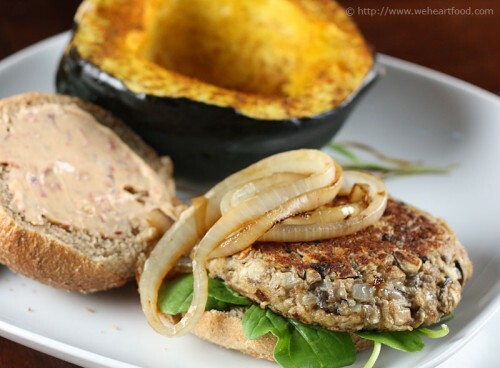 This chicken burger recipe comes from Fitness Food. 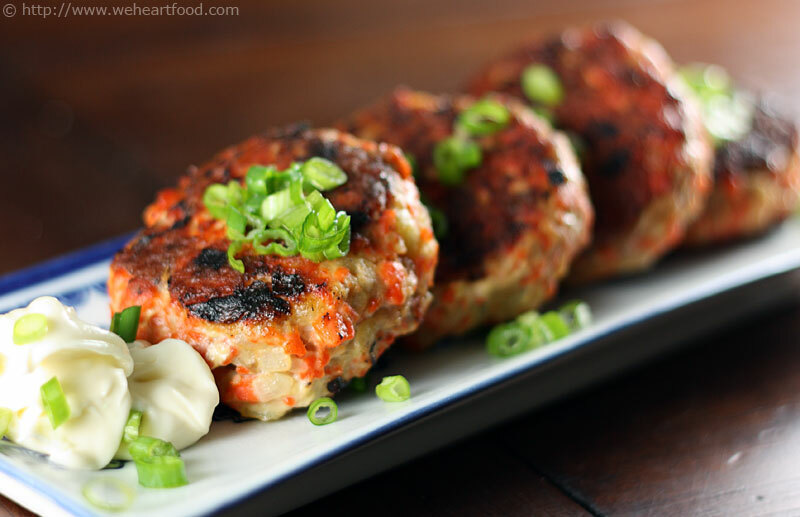 Ground chicken is mixed with breadcrumbs, cilantro, chili sauce, and spices, and formed into burger-size patties. It’s served with ribbons of cucumber and carrot, and a sweet cilantro-vinegar sauce. I got bit by the time-bug on this recipe, too! They would have been done 30 minutes earlier if I had remembered the “refrigerate” step. At least we had that beet salad to snack on! True… anyway, I like these. Though I think next time I’ll form them a little thinner so they cook more quickly. Yeah these are monsters! What’s this sauce all about? It’s just a sweet cilantro sauce to go on top… it was supposed to also have peanuts in it, but we were out. I know that when one of us cooks, the other does the dishes, but… how the heck did you use so many dishes tonight? Just sayin’. I’m getting dishpan hands over here. Cut the chicken into 1″-2″ cubes and place in a food processor, and pulse until minced. Remove to a bowl, and mix with the breadcrumbs, garlic, cilantro, chili sauce, ground coriander, and green onions. Mix together with your hands and form into four patties. Refrigerate, covered, for 30 minutes. To make the dressing, put the sugar, vinegar, and 3 tbsp water in a small saucepan and stir over low heat until the sugar dissolves. Simmer for 5 minutes or until slightly thickened. Cool and stir in the peanuts and extra cilantro. Peel strips of carrots and cucumber into ribbons. Heat a grill or grillpan and spray with oil. Cook the burgers for 4+ minutes on each side, or until an internal temperature of 165 degrees is reached. 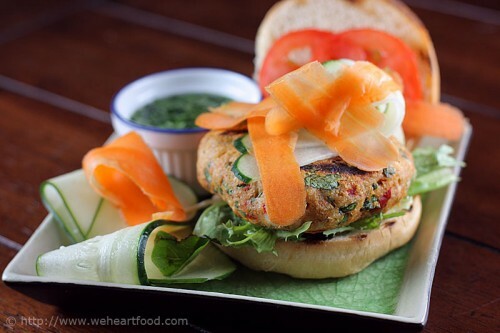 Serve on hamburger buns with the dressing, lettuce, tomato, carrot, and cucumber. Lisa modified a recipe from Southern Living and created hands-down the best homemade bean burgers we’ve tasted. Accompanying the burgers were roasted portobello mushrooms, corn salsa, and an adobo mayonnaise. I mean I’m in love with you cooking these awesome dishes! Don’t get too used to it, I feel like I’ve been cooking for hours. Well worth it — and there’s a bunch of leftovers, so next time it’ll only take a few minutes to heat up. It all evens out. Anyway, substituting chipotle peppers for the jalapeno in the recipe was such a good call. That smoky flavor of the burger was perfect with that adobo mayo. Well it *is* chipotle week… we had a lot to go through. Don’t feel like you have to eat all the accompaniments, I just love roasted mushrooms so I went ahead and made them. Are you kidding? I’m all about condiments. I’m having it all. Sauté first 4 ingredients in hot olive oil in a large nonstick skillet over medium-high heat 8 minutes or until onion is tender. Mash black beans and pinto beans in a large bowl; stir in onion mixture, salsa, and next 4 ingredients. Cover and chill 30 minutes. Shape mixture into 8 patties. Place on an aluminum foil-lined baking sheet coated with cooking spray. Coat patties evenly with cooking spray. Chill 30 minutes. Bake at 400° for 15 minutes or until browned and thoroughly heated. Serve on a bun with whatever condiments suit your fancy. You can make adobo mayo by adding one teaspoon of adobo sauce to some light mayonnaise. Since we loved, loved, loved these burgers, let’s submit this to the Legume Love Affair Event!